News & Events - DUAL-ADE inc.
Business Elite Canada – April 2016 – We adapt our product according to the requirements of the Customer and there requirements are changing all the time. We rely on our staff by promoting values like communication, rigor and innovation. 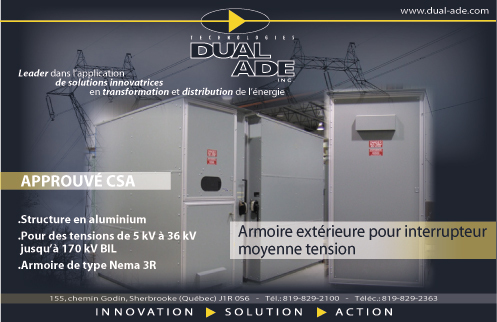 In the spring of 2006, Technologies Dual-ADE revealed its brand new structure design for the construction of modules for electromechanical systems. Designed by Mr. Yves Thibault, Director of Innovation and Technology, the Modu-AL was immediately recognized as a significant innovation by several industry stakeholders. Aluminum is a very significant leverage in our development and success, which differentiates us from our competition today. We have surprised and impressed our clients with this alloy, Aluminum, which we have included in our equipment. After two years of Research and Development, we have replaced the steel structures of our switchgear cabinets with Aluminum structural members – extrusions. Thank you to ALOUETTE and particularly to Mr. Donald Galienne for having supported us in our development. As a result, together we have succeeded in creating an innovation which was daring at the start and yet – as seen by its success – seems obvious today. 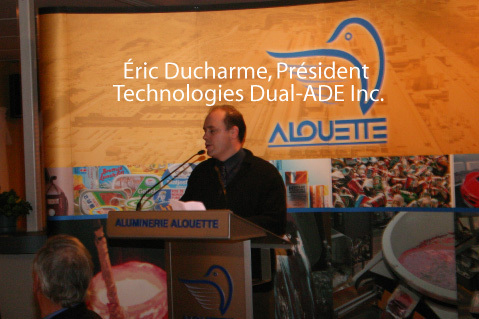 You will be hearing more about Dual-ADE in the future since we have other ideas which will involve Aluminum and are proud of our association with Alouette. Last May, we obtained a contract with Hydro-Québec International in Haiti. The first part of the contract would consist of tests at the Sault-Mathurine power plant in the Les Cayes region (transformers, circuit-breakers etc.) over a period of approximately 7 full days. We have obtained a second contract in collaboration with UNOPS for a retrofitting project at the Onde Verte power plant. THE 9TH ANNUAL GOLF TOURNAMENT WAS HELD ON SEPTEMBER 14, 2012 AT THE CLUB DE GOLF DE SHERBROOKE GOLF COURSE. Once again this year, the activity was a great success! We would like to thank all the event sponsors listed below. Their contribution to this event made it possible to award several door prizes during the evening and to hold an auction to help people in need. Thanks to your participation, this event raised $3,753 (donations, golf/meal sales, “3 tier” draw, drink sales and tips) for Centraide Estrie. The counting isn’t finished! The contribution from the DUAL-ADE employees will be added to this amount. As a reminder, last year the final amount given to Centraide Estrie was $24,199. We invite you to take part in our lobster dinner on Friday, May 8, 2013. This benefit supper helps us to continue our mission with adolescents in the Rock-Forest St-Élie and Deauville Boroughs. 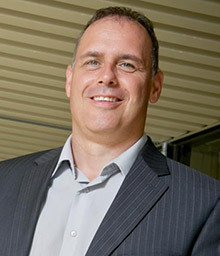 Éric Ducharme, President, Director General Technologie DUAL-ADE Inc.